Ordered Decware DNA speakers from Decware last year. Knew I wanted a clean accurate sounding loudspeaker to go with my 6 watt SET Amp. Waited 5 months for the speakers to be built and have been very satisfied. When the DNA's arrived I was using a Klipsch Quartet's with upgraded crossover networks(Bob Crites). I thought the Quartets were decent and was happy with them. Well I started to compare the Decware DNA's to the Quartets and it only took 2 songs and the Quartets were replaced and sold in 2 days.The DNA's do not give that Rock N Roll in your chest pounding bass but instead there is a beautifully clean accurate bass. 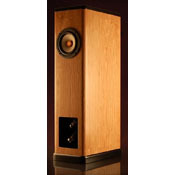 If you desire a small footprint speaker with great accurate sound I recommend these babies.